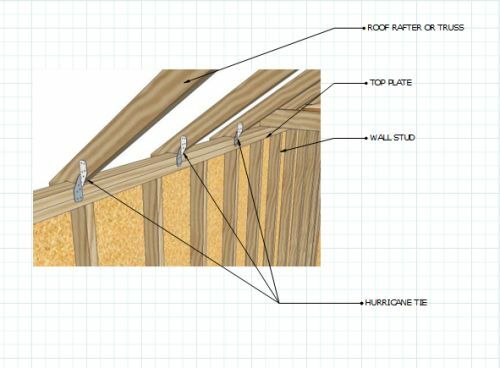 It's important to use hurricane ties when framing your shed roof. 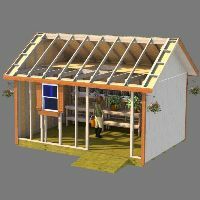 In fact, almost all building codes across the United States require their use when framing a shed roof. These ties were developed to help strengthen the framing for roofs to help prevent damage from strong wind and seismic forces. The most popular developer and manufacturer of these ties is The Simpson company. There are several types of these ties available. 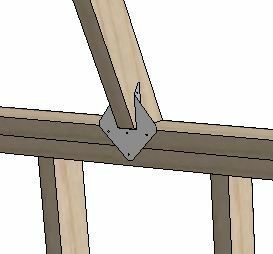 I have had to use the one pictured above when a standard tie would not clear the top of the truss for the shed I was building. These ties also come in double 2x4 widths. 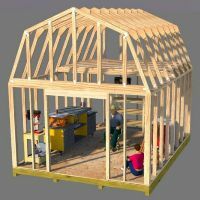 They come in handy for example where you have your roof truss/rafter resting on the top plate and it has an adjacent ceiling/loft joist butted up to it. 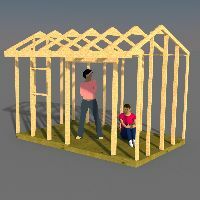 In a case like that, using the double wide will anchor both framing members down to the top plate. You can find most of these ties at your local Lowes, Home depot, or Menards. 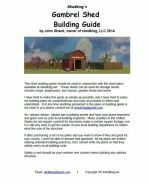 See more information about other neat shed building stuff and terminology here.